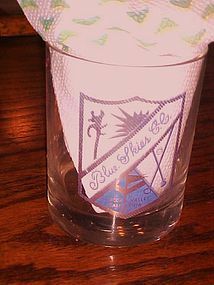 Vintage bar glass from the original Blue Skies Country Club in Yucca Valley California that was originally opened in 1956. Later Closed in the 1980's because it had been neglected and found to be the Town of Yucca Valley Code Compliance Division has declared all property belonging to the former Blue Skies Country Club a Public Nuisance and Hazardous Area. The property was just recently purchased again. Glass measures 4 1/8" tall and has heavy solid bottom with gold and blue graphics of golf clubs, a yucca plant, and the sun. I have 7 available and all are in great condition, but priced per glass. A wonderful item to add to your vintage Golf memorabilia.